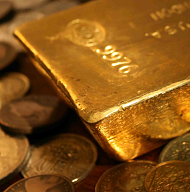 IT'S TIME for contrarians to get bullish on gold, writes Frank Holmes at US Global Investors. Gold can't seem to catch a break. The yellow metal normally acts as a safe haven in times of political and economic strife, but in the face of Turkey's Lira meltdown, investors have taken cover instead in the US Dollar. 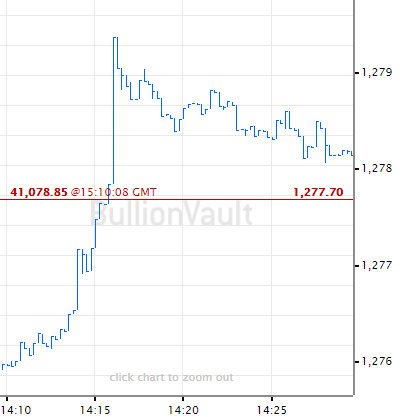 This month the stronger greenback pushed gold below $1200 an ounce for the first time since January 2017. The Lira fell to its lowest level ever recorded against the Dollar, mainly in response to President Donald Trump's call to sanction and double steel and aluminum tariffs on Turkey. This sent gold priced in Turkey's currency to all-time highs. If you recall, we saw the same thing happen recently in Venezuela, where inflation is expected to hit 1 million% by the end of the year. Turkey's faith in gold was on full display as President Recep Erdogan urged his fellow Turks to convert their gold and hard currencies into Lira in an effort to prop up the country's hammered currency. The same strategy was used in December 2016, a month after Trump's election sent the Lira tumbling against the Dollar. 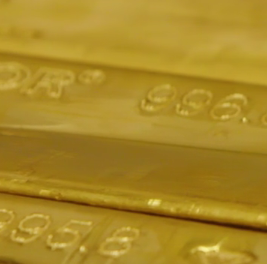 As I've discussed before, Turkey has a long and rich history with gold. Home to the world's very first gold coins more than 2,500 years ago, Turkey still stands as one of the largest buyers of the yellow metal. In the June quarter, the Eurasian country was the fourth largest consumer of gold jewelry, following India, China and the US. Twelve and a half metric tonnes were purchased in the three-month period, up 13% from the same time a year ago. Along with Russia and Kazakhstan, Turkey also continues to add to its official gold holdings. Its central bank's net purchases in the first half of the year totaled 38.1 metric tons, up 82% from the same six-month period in 2017, according to the World Gold Council (WGC). This made it the second highest buyer, after Russia. Gold investors might be discouraged by its performance this year, compounded by news that hedge funds are shorting the metal in record numbers. A lot of this has to do with the fact that, so far this year, gold has had a very high negative correlation to the US Dollar – more precisely, a negative 0.95 correlation coefficient, according to gold research firm Murenbeeld & Co.
What this means is that gold prices have been moving in nearly the exact opposite direction as the greenback. I think it's important to point out that, despite a stronger Dollar, gold is still up for the 36-month period – and climbing even higher over the long term. 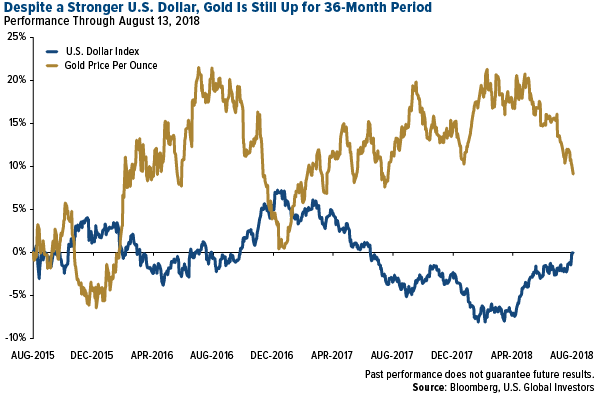 The Dollar has only recently broken even, whereas gold has continued to hit higher lows since its phenomenal breakout in December 2015. There's another sign that gold has found a bottom. 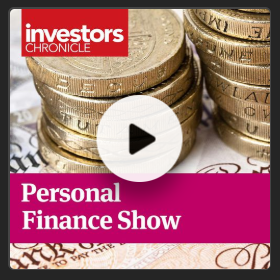 This month I spoke with Kitco's Daniela Cambone about Vanguard's decision to change its Precious Metals and Mining Fund. 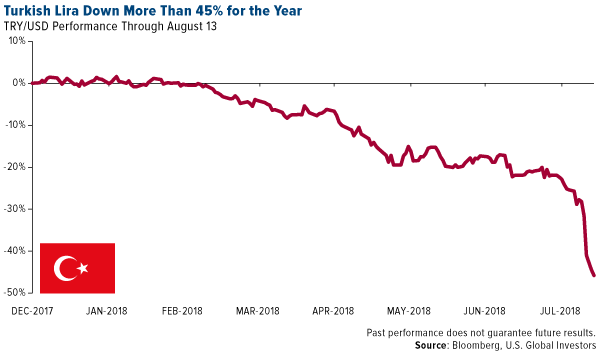 Starting next month, the fund's exposure to metals and mining will be dropped from 80% today to only 25% – meaning the world's largest fund company will no longer offer investors a way to participate, should gold and precious metals rally. This isn't the first time Vanguard has done this to investors. Back in 2001, it removed the word "gold" from what was then the Gold and Precious Metals Fund. 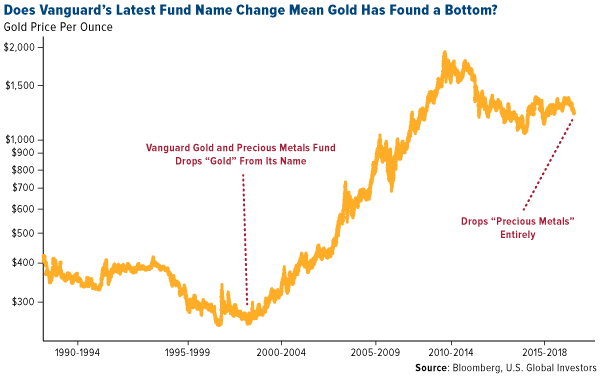 The change coincided with a decade-long precious metals bull run that saw gold rally from an average price of $271 an ounce in 2001 to an all-time high of more than $1900 in September 2001. That's more than a sevenfold increase. And now it's dropping the fund altogether – at a time when gold might be ready to break out. So could this mean another bull run is in the works? No one can say for sure, of course, but the timing of Vanguard's announcement is certainly interesting.